I’m a rather old-school gamer, more used to descriptive combat, judgement calls and hand-wavery than a strict adherence to the rules. Even when I ran the tactically intense D&D3.5 I kicked it into submission with my gaming style. With Pathfinder, I’m modifying my style somewhat. I’m doing my best to stick to the rules. No, I’m not tracking low-value spell components, and yes, PC/NPC social interaction still requires a fair bit of handwaving. But I’m using minis – Pathfinder Pawns, actually – battlemaps, combat trackers, and there’s no friendly fudging to save PCs’ necks. Many of the reasons for old-school handwavery and friendly fudging simply don’t exist with Pathfinder (or, to be fair, with D&D3.5). Combat is more of a tactical skirmish game if you have minis/counters. Rules are clear and more comprehensive than older systems – there’s less need for a judgement call. And, particularly with Pathfinder, rules are there online for players to read and become familiar with. I’m not stopping my old style – there’s plenty of scope for it with other games – but I find the experience of GMing Pathfinder a rather liberating one. I’ve also become something of a Pathfinder fanboy – as well as rules and setting books, I’ve picked up a couple of the adventure paths, and some tabletop accessories of use in many different games. I’ve also bought the comics and some of the novels in digital form (and though I generally loathe game fiction, Dave Gross’s novels I rather like). 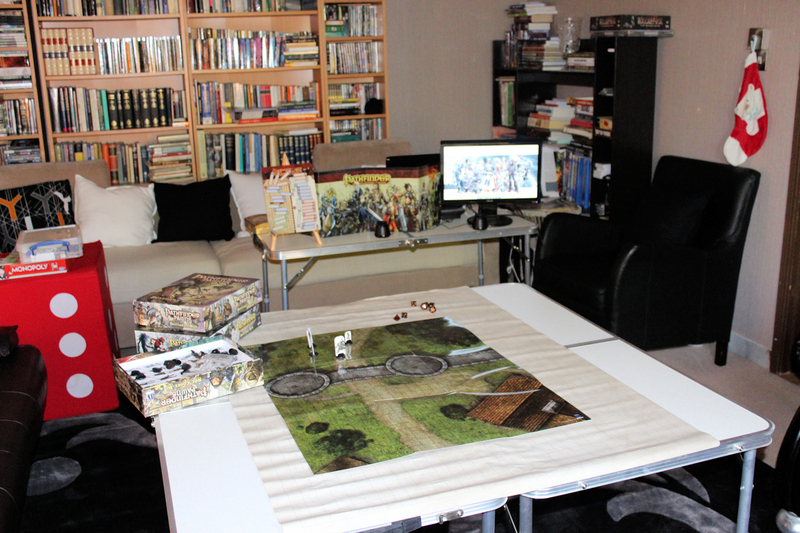 Last week, several players were off watching the Hobbit before the game, so after setting up the lounge for play, I had enough spare time to photograph it (yeah, OK, I was bored). The player set-up is reatively simple. I’ve several sets of Pathfinder pawns (very high quality cardboard minis, which I highly recommend as a much cheaper and still attractive alternative to metal or plastic minis), a handful of Pathfinder flip-mats and map packs, with a Chessex megamat for drawing battlemaps on the fly. I am running this as a tactical game, so the battlemaps and counters are crucial. The table will also see maps of Golarion (the Pathfinder world) and its towns, villages and the like laid out as well. The Pathfinder pawns, by the way, I happily use for any fantasy game, backed up by things like Steve Jackson Games’ Cardboard Heroes and Arion Games’ and Okumarts paper minis when necessary, or when I’m playing genres other than fantasy. I let players pick appropriate pawns for their characters from the NPC Codex box. Besides that, they’ll have their character sheets and dice (because dice are in fairly short supply in the Middle East, I keep plenty of spares). 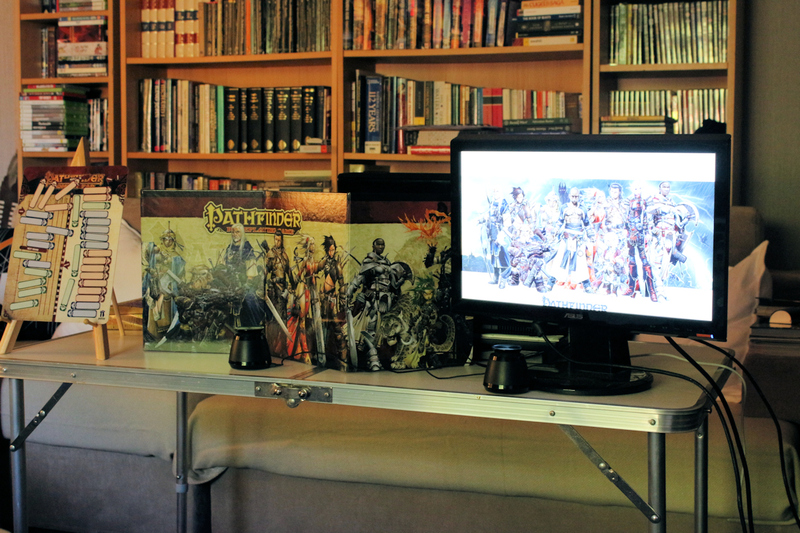 I encourage players to bring spare Pathfinder Core rulebooks – either physically or digitally. If I forget a rule, they can pick me up on it. This is not rules lawyering – I have some great players – but a valuable aid to me as I try to follow rules more closely than I have over the past 30 years. The only thing I don’t like is players checking the bestiaries to find opponents’ stats and weaknesses. I don’t usually use a laptop for anything more than playing mood music when I GM. It’s different for Pathfinder. The PDFs are so well designed that they’re excellent to use in play – not only are they well bookmarked, but they are hyperlinked within the text, so you can click on a creature’s special abilities and be taken to the rules definition, or follow up combat results to check the effects of a condition imposed on PCs or opponents. Other game companies take note: this is what you should be doing when you make PDFs for sale. With using a laptop comes the second monitor to display maps, handouts and NPC portraits. I didn’t plan for this; I ran out of printer ink just before the first session, so rigged up an old monitor as a stand-in. It worked well, so I added it to the regular set-up. I’ve currently got a Pathfinder wallpaper set up, but that can easily change for other games. I could also use it for inspirational illustrations, but there are relatively few available for sale in a suitable digital format. I also run Hero Lab on the laptop, and keep the master copies of the PCs stats there. Players can have printouts, but my electronic copy is the master when in doubt. I don’t use Hero Lab’s combat panel in play – I haven’t quite succumbed to that yet. The Pathfinder GM screen is mostly just to shield my notes. It does have reference tables and whatnot, but my eyesight is now bad enough that I have to switch between reading glasses and distance glasses – and even then, the print is small enough and on a greyish background, that I find it hard to read – and the PDFs do a good enough job of getting me to a relevant rule in a hurry. In addition I have the magnetic combat pad (on the left). This is one of the best game accessories I’ve ever bought, and I highly recommend it to anyone running any game with complex initiative orders. It helps me track PC/opponent turn sequence, the number of rounds, when spell duration expires and the like. Brilliant – a major, major aid to keeping things as close to the rules as possible. I put it on a mini-easel so everyone can see it, everyone knows when their turn is coming up, and can remind me if I’ve skipped someone (and they do, even if I skip an opponents’ turn – I have good players). It doesn’t always stop dispute, but it does keep it to a minimum. Speakers are there for mood music. I use a lot of film or game soundtracks, but I’ve also used things like the fan-generated Pathfinder Goblin Song, which annoys my players intensely when ever they fight goblins – at least it speeds up combat. I also keep a good stack of printed rules behind the screen – rulebooks, any adventure path I happen to be running (Rise of the Runelords at the moment), and printouts of stat blocks for easy reference. And a space for rolling my dice – I have experimented with rolling openly, but I found myself running backwards and forwards from player table to GM table too much. It’s all ready to add players. This entry was posted in Gaming and tagged Pathfinder, RPG craft, tabletop. Bookmark the permalink.